After the excesses of the Thanksgiving table, all I wanted was a light, vegetarian end to our weekend, which is why a big plate of stewed vegetables sounded like the perfect Sunday dinner. But I should probably also note that as I'm nearing the end of The Omnivore's Dilemma, I've become frantically wide-eyed and horrified at the thought of most of the food accessible to me (with the exception of the goods on display at the farmer's market), so eating a pile of vegetables whose origin I (mostly) know just seems so much safer. 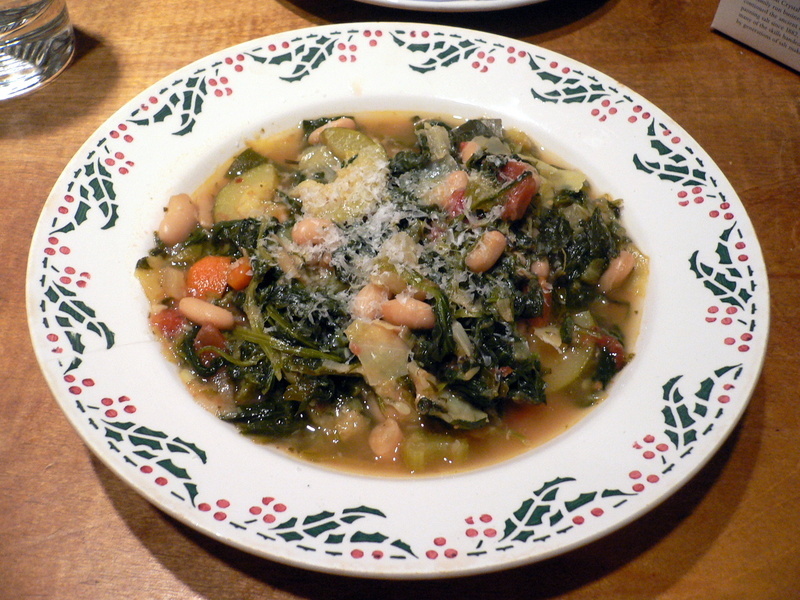 Maggie Barrett's recipe for ribollita (a twice-boiled bread-and-vegetable soup) is a quicker, breadless version of the classic Tuscan dish. Not only is the ingredient list simple and pure, but the preparation is peaceful and I wanted nothing more than a easy cooking experience after a relaxing day of lunching with friends and reading in bed. Sometimes Sunday cooking is about pulling out all the stops, but sometimes it's just about simplicity. You cook most of the vegetables together in oil until they start to caramelize before throwing in water, tomatoes, the beans and the herbs. Although I halved the recipe (and left out the yellow squash, because yuck), I needed to use the same amount of water, so keep that in mind if you make this yourself. I wonder if the full recipe, cooked as Barrett indicated, would turn out too dry? After an hour of simmering, I added frozen leaf spinach instead of the fresh stuff, but I wouldn't do that again - I'd buy chopped frozen spinach. The leaf stuff is too long. We drizzled our bowls with olive oil and sprinkled grated Parmigiano on top. We breathed the savory steam in deeply and ate our stew with crusty Portuguese rolls. The long-cooked vegetables were sweet and tender, the beans yielded gently in each mouthful, and the grassy oil complemented the verdant spinach. This isn't the prettiest dish you'll ever make, but it's so satisfying, healthy and warming you'll find yourself making it again and again. It's such good winter food. 1. Heat a large soup pot over medium-high heat. Add thе oil. When hot, stir in thе onion, garlic, celery, carrots, zucchini, squash, fennel and cabbage. Season with salt. Cook for 15 minutes, stirring occasionally. 2. Add thе beans, tomatoes, herbs and 2 cups water. Seаson with more salt, thеn gently fold togethеr until combined. Press on thе solids so thеy are submerged in the water. Bring to a boil, then lower thе heat and simmer uncovered for 1 hour. Stir gently only once or twice. 3. Fold in the spinach and simmer 30 minutes more. Remove thе bay leaf. Stir in more salt and red-pepper flakes tо tаste. 4. Ladle the soup into individual serving bowls. Drizzle each with olive oil and sprinkle with grated Parmesan. If you choose, serve with bread.